some quick thoughts on the silk cami: i find this in S to be cut a bit big through the torso and armholes, so i probably could have sized down to an XS and still retained a somewhat slouchy fit. the silk crepe is good quality – not too thin, drapes well and lined along the bust area. definitely not sheer. overall a solid silk staple for summer into other seasons. what are your current summer faves? Your outfit looks so summery and comfortable! 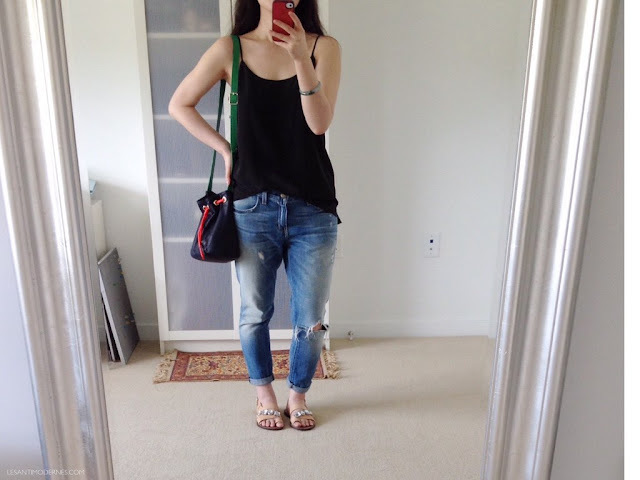 And thanks for the mini-review of the Everlane camisole. I never wear camisoles on their own, mostly because I never know what to wear underneath. I don't like bra straps showing, but strapless bras are so uncomfortable, especially when it's hot outside. hey Tammy! i think the cut of this cami definitely gives you the option for some kind of lightweight bra/bandeau underneath :) though i don't mind a pretty strap peeking out of a summery top either. i 2nd tammy. those jeans & cami look really comfortable. I just bought a lt grey maxi skirt from f21. i'm stick to oversized tops & cotton & machine washable clothes to try to beat the heat. Having a 34DD chest I need a bra so no camisole for me although I love the look on you. I have many Silk tanks for Everlane. I wear them at work with an open cardigan from Eileen Fisher and skinny jeans. Still (ALWAYS) wearing my J Crew button front boyfriend shorts with Gap and J Crew white tanks, a navy/ white striped St James Breton or a Madewell chambray over the tank. Just bought a cute Current\Elliot sweatshirt from The Outnet sale, a white poplin popover from Banana Republic, and a black/white striped tank midi dress from Old Navy. On my list: Comfy footbed sandals in black or luggage tan. My favorites are an oversize white shirt by MiH, white Frame Le Garcon jeans, and a pair of flat black Matt Bernson sandals with tiny gold studs and wraparound ankle straps. I bought them new on eBay for $30 a few years ago and cost per wear is miniscule. Currently living in: cropped wide leg trousers, a white poplin off shoulder top from Madewell, J Crew Carrie camis in various colors, white Current/Elliott denim cut-off shorts (not having a washer/dryer in my apartment, I cannot commit to white jeans), Ray ban folding wayfarers (oversized and mich better fit than the original), and my Aquazzura Belgravia lace up espadrilles nabbed on sale from Neiman Marcus. I balked at the price of the Belgravias for an espadrille, but i spent 99% of my time in casual flats so they turned out to be worth it from a quality/comfort/cost-per-wear perspective. Cute outfit, love the way those jeans fit on you! At the moment I'm living in denim cutoffs and loose-fitting tops. I love the look of camisoles but I too am not a big fan of visible bra straps. I do have one strapless bra that I like but it's a bit too light-colored, not a close match of my skin tone so it's hard to wear under light colored tops. Only a month into summer and already I'm longing for jacket weather!